Fellowship Farm hosts the Greensboro, NC Chapter of NCDCTA’s Junior Club. Being a part of the NCDCTA Junior Club gives juniors an opportunity to learn about horses, serve the community, and have fun with other juniors who love horses! Fellowship Farm’s chapter of Junior Club is open to ALL juniors in the surrounding area who would like to participate. Members of the Junior Club do not have to own a horse and will have many opportunities for hands on learning. 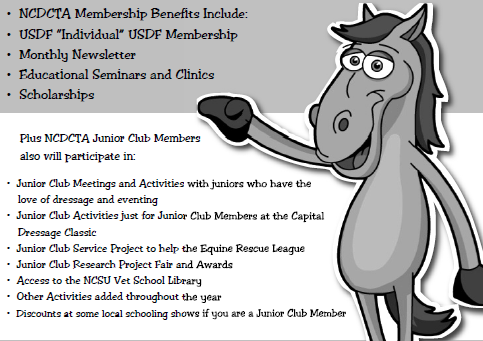 The NCDCTA describes their purpose for the Junior Club below. View our Junior Club archives page to see all of the fun activities the Greensboro Chapter has organized so far! Visit the NCDCTA website for more information or to sign up for Fellowship Farm’s Greensboro Chapter of Junior Club. Contact Fellowship Farm for more information or to get started!